Achtung Autobild! Lay off the blueberry schnapps. While the growing influence on European Ford design by their North American masters frightens us too, we don't think they'll go so far as to mandate that the 2012 Ford Mondeo Coupe look like our favorite fried fish. 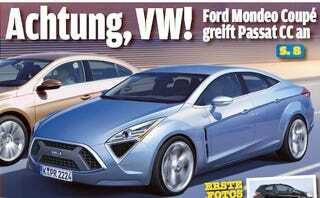 In fact, since it's already the best looking, best driving vehicle in its class, we're skeptical of the claim that Ford intends to build a four-door coupe version of the Mondeo at all, much less one that looks like this rendering from the always-quick-to-the-drawing Autobild. If we have one piece of advice for the Germans, it's to stick with the Goethe.